This is the date on which your container storage agreement will start. Please use the calendar control to select your preferred start date. This is the date on which your container storage agreement will end. The minimum rental period for any container is 1 week (7 days). Please use the calendar control to select your preferred end date. 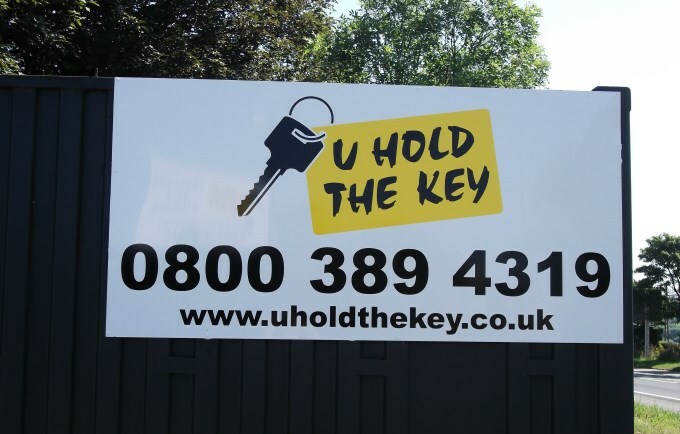 U Hold the Key currently operate in 9 convenient storage locations. Click the help icon next to the input field to see all of our locations on a map. Choose a Container Type from the drop down list based on the best size for what you are storing. Click the help icon next to the drop down list to see more information about each Container Type. Please select your preferred key pickup date (we'd suggest this be the first day of your storage agreement) - but we're flexible. 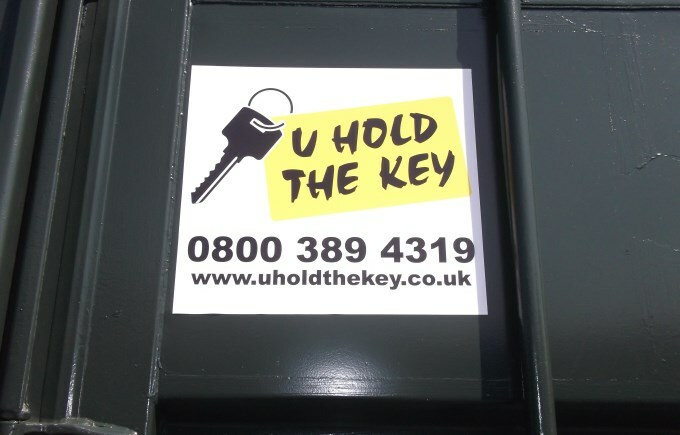 You tell us what time on the selected date you'd like to come and pick up your keys to your storage container. We'll contact you to confirm the time you've booked. If we haven't contacted you within 2 hours of the time you've requested can you please give us a call on 08003894319 to confirm we can meet you at the selected time. The price will update automatically based upon the choices you have made. Once you are happy with the choices you have made, click the Add To Basket button and you will be redirected to the Basket page to complete your order. Location Select a location Birtley Grantham Newcastle Bishop Auckland Darlington Stockton Sunderland Mainsforth Middlesbrough Stockton A19 ? Container Type Select a type ? Please be aware key pickup time must be a minimum of 2 hours from booking! This is the date on which your container storage agreement will start. Please use the calendar control to select your preferred start date. This is the date on which your container storage agreement will end. 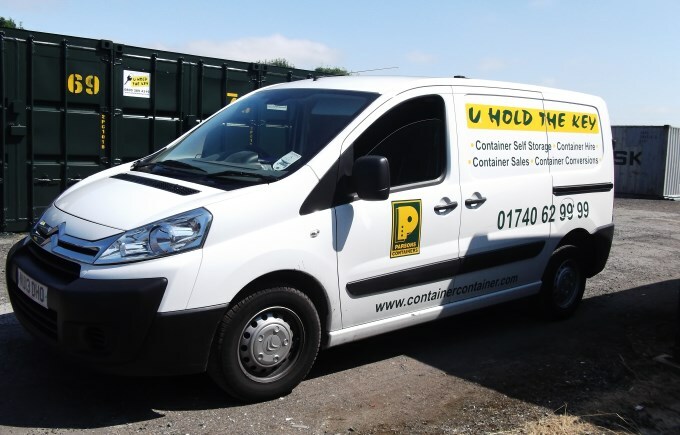 The minimum rental period for any container is 1 week (7 days). Please use the calendar control to select your preferred end date. 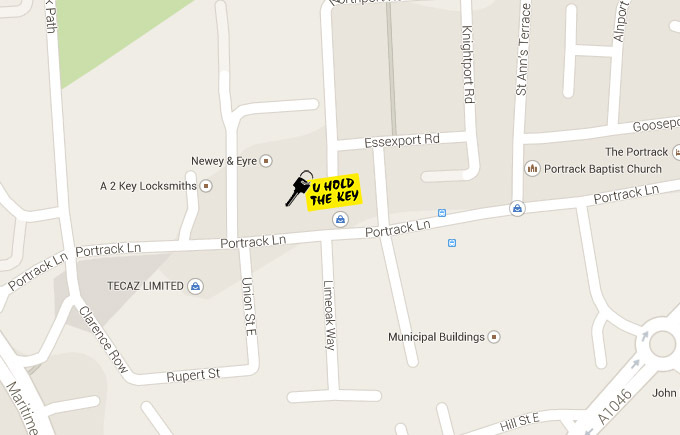 U Hold the Key currently operate in 9 convenient storage locations as shown on the map below. Please use the drop down list to select your preferred storage location. These stores are great for student storage or storing stuff like those Christmas decorations. This size is presently only available on our site at Newcastle. These stores all have double door access so are great for motorbike storage or anything else that needs a compact secure space. About the size of a large garden shed – but a lot more secure. A good size for the bits that are over spilling in the spare room or if the kids have moved out or if you’re starting a new business and need some where to keep your tools or filing. A bit bigger than a compact. We would recommend this size for a move from a 1 bedroomed flat but also a great size for businesses for archive storage or if you want to get your garage or spare room back. 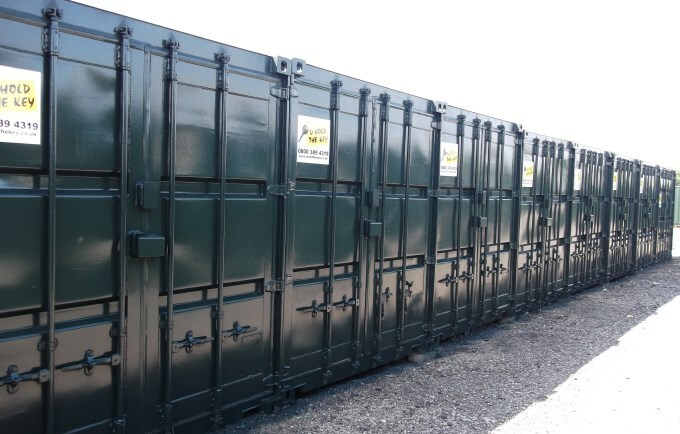 Some of our standard containers have double doors and some have personnel doors. To visualise this space, think of a spare room size. It’s a good sized space again for both businesses and house moves. This is the most popular size store we have and we describe this space as the equivalent of a good sized single garage although I wish my garage was that big! This size is big enough for most 3 bedroomed house moves. All of our large containers have double door access so are ideal for storing your car or boat. It’s a great space for business storage and if you’re looking for archive storage we can shelve it out for you for a small extra charge. Ask us for more information. When you need a bit more than our large container. You’ll get a lot in here. For when you have lots to store. This is great storage for businesses that don’t want the added cost of taking on a warehouse or business premises but still have lots to store. We'll contact you to confirm the time you've booked. If we haven't contacted you within 2 hours of the time you've requested can you please give us a call on 08003894319 to confirm we can meet you at the selected time. Our site in Stockton is in the centre of the town at the end of Portrack Lane. We're opposite Tecaz bathroom showroom, just off Portrack Court. Being in town makes it easily accessible whether your using public transport or travelling by car. The site is in a good location for customers from Stockton, Yarm, Billingham and Norton as well as other towns and villages in Teesside. Join our mailing list to keep up to date with everything thats happening in the Parsons Group of Companies.